Rat Queens Special: Neon Static, an electric new one-shot! 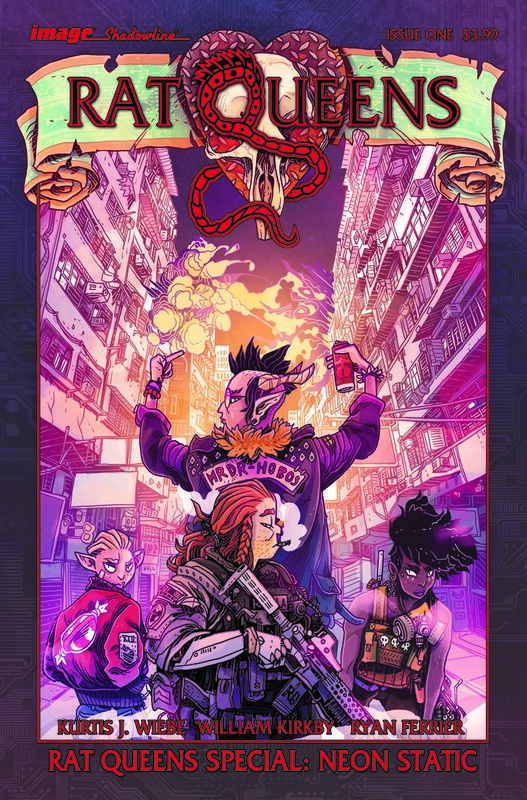 Fans will experience a cyberpunk take on the RAT QUEENS by Kurtis J. Wiebe and Will Kirkby from Image/Shadowline this July in an electrically thrilling one-shot, RAT QUEENS SPECIAL: NEON STATIC. 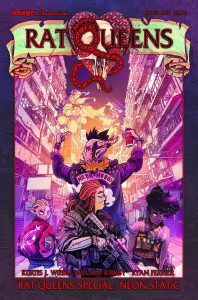 Readers will need to strap themselves in for a ride to an alternate and futuristic world, where the Rat Queens take to the neon streets of Palisade as an elite team of shadow operatives. An anonymous fiend creeps through the dark web, stealing identities and blackmailing innocent civilians for cold, hard Goldyen—and only the Queens can stop him! RAT QUEENS SPECIAL: NEON STATIC one-shot (Diamond Code MAY180047) hits stores on Wednesday, July 18th. The final order cutoff deadline for retailers is Monday, June 25th.